One major tenet of Eskolta’s mission is centered on encouraging a culture of self-empowerment for both the educators and the students of the schools we work with. Our case study on one elementary and middle school in Jamaica, Queens, P.S./I.S. 268, provides an example of the impact felt by both teachers and students as a result of Eskolta’s academic behaviors coaching. Accompanying the case study is a protocol, developed by Eskolta with support from the NYC Department of Education’s Office of Postsecondary Readiness, that can be used with a group of teachers to reflect on classroom approaches to growth mindset, the belief that intelligence can grow with effort. P.S./I.S. 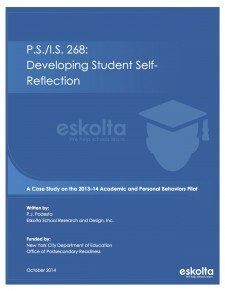 268: Developing Student Self-Reflection is one of five case studies written on the Academic and Personal Behaviors Pilot, an initiative of the NYCDOE Office of Postsecondary Readiness. In the 2013–14 school year, four New York City middle schools and six New York City high schools took part in the project and were asked to modify the way in which they gave feedback to students toward the development of growth mindsets and promotion of academic persistence. This study reveals the transformations that a team of teachers at P.S./I.S. 268 witnessed in their students’ attitudes toward learning after adopting growth-mindset practices over the course of the year. Key strategies that the team utilized to foster an environment where effort is viewed in a positive light included: displaying that mistakes are critical for learning, emphasizing the value of struggle and progress, and creating opportunities for student reflection. Teachers Michelle Mills and Kaylonda Marin noted that the conscious use of growth-mindset language in giving feedback helped build confidence in students and that the consistent self-reflection cycles helped students learn how to push themselves to embrace challenges and set higher goals.